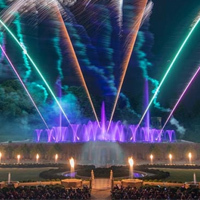 Our Fireworks & Fountains Shows return on six spectacular evenings! - Lawn: Bring your own chair. Chairs may be set up beginning at 12 pm. - Reserved Seating: No need to bring your chair or wait in line. Reserved seating allows you to select your seat for the show, then arrive to your chair already placed and waiting for you. Special ticket required. Sell out likely. Fireworks & Fountains tickets provide all-day admission to the Gardens. To request 1906 reservations for Fireworks evenings, please email 1906@longwoodgardens.org. Reservations will not be accepted via Open Table. Make your 1906 reservations early–sell out is likely! The following areas will be closed all day on Fireworks & Fountains Show days: Oak and Conifer Knoll, Eye of Water, Chimes Tower, and Hillside Garden. 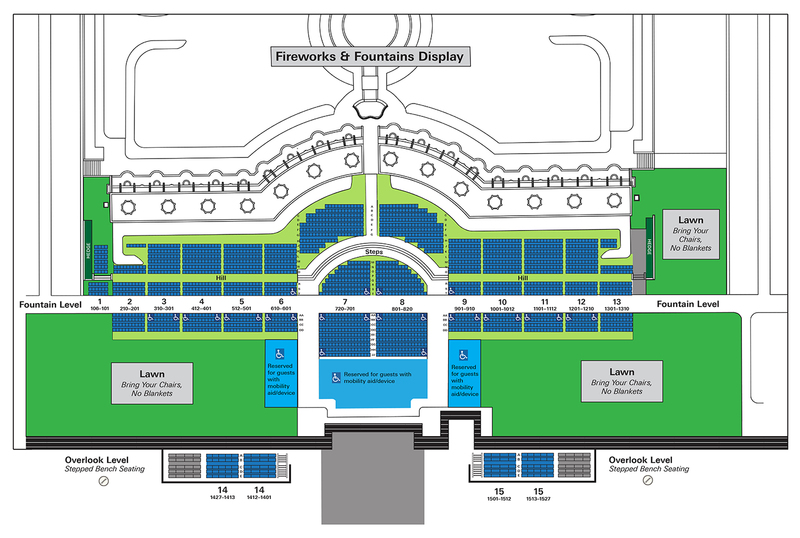 The Main Fountain Garden fountain area, Idea Garden, Rose Garden, and Topiary Garden will close 75 minutes prior to the start of the show. Fireworks & Fountains Shows will proceed in rain. Extreme weather conditions (lightning, hail, or high winds) may require the show to be delayed until the weather clears or postponed to the alternative inclement weather date. In the event of postponement or cancellation, tickets buyers will be notified as soon as a decision is made. The decision to delay or postpone will be made 90 minutes prior to scheduled show time. Umbrellas are permitted in the Gardens and cannot be used during the performance so as not to obstruct the view of other guests. Rain gear is highly recommended. Fireworks tickets are non-refundable and may not be exchanged for another date or time. Should we experience extreme weather conditions, the show will be rescheduled for the next day at the same time and ticketholders will be notified.